Starting out, I had no idea what Persio should look like. Shof and I both knew we wanted to name him after our maternal great-grandfather; Persio Manuel Reis. I knew in some ways he was going to be the heart of the team - a doting father, difficult husband, and an unreliable teammate. But what should he look like? I hadn't a clue, which presented a problem because the couple of times Shof asked for a hint when designing him, I'd skillfully evade. Partially because, as I said, I had no clue what he should look like, but also because I totally trusted Shof to get it right as he often does, and did again! I think the first two images above are what sold me on this design. There's a terrific range of human emotion in those two images. I've often lamented the fact that so many comic book artists draw expressions, rather than emotions. Characters on their pages don't act with their faces, and I think that makes it too easy to let your eyes gloss over the panels and just read the word balloons. Not so here, you can see Persio's soul, and that's what I really love about this design. On with the character profile! A bonafide scientific genius, Persio holds doctorate degrees in xenobiology, astrophysics, oceanography, and aerospace engineering from nearly a dozen learning institutions across the galaxy. If the team needs to build it, break it, birth it or brainstorm it, Persio's the man for the job. Despite this, he's also the team's biggest joker, and seemingly never takes anything seriously, a character trait that frustrates his wife, Sulesh, and teammates Denarii and Stein to no end. A trait which has seen the team suffer just as many close scrapes as his brilliance has spared them. That sentence doesn't read quite right. Welp. To close out this latest missive, I leave you with the latest work in progress images from the Sulesh bust Funlola's working on. You can see the structure of her face begin to take shape, and the first hints of her clothing as well. 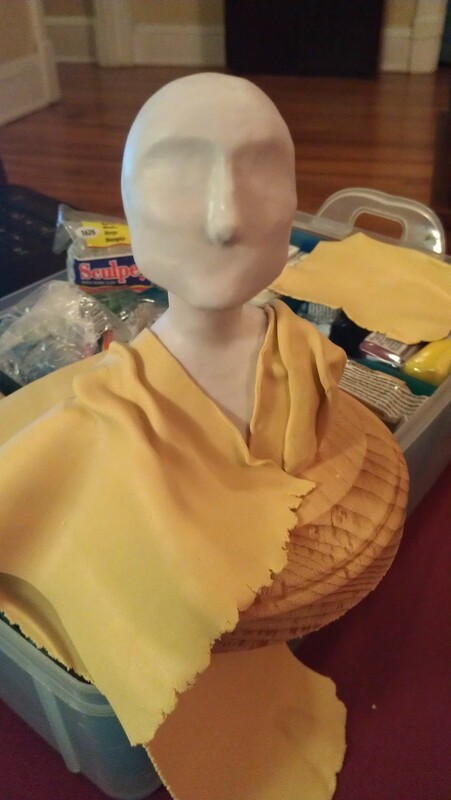 Once the sculpt is complete, I shall eat it in order to ingest its power. I kid!